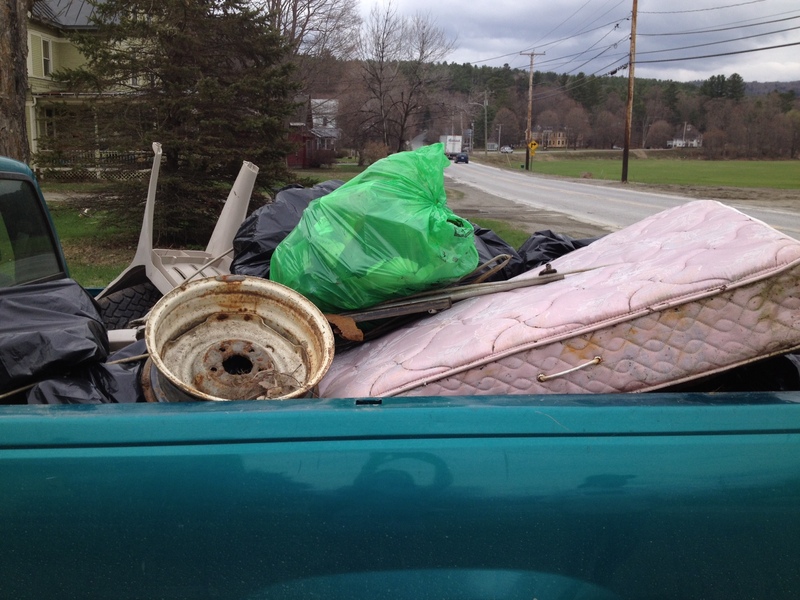 …on Green Up Day, when Vermonters comb the Land for garbage and citizens with trucks (not uncommon in Vermont) haul it off to the dump. Literally tons of garbage statewide. I found the usual assortment of party implements plus mystery stuff. Like Spider Man underwear (size: extra extra small; they make underwear this little?) and a shoe so badly destroyed you had to wonder what happened to it (threshing machine? Two bears fought over it?) Also a sign th at said WATCH IT GROW (watch what grow, the cubic volume of garbage? A Bud Light tree?) The kindly lady I worked with had somehow hauled a mattress into her truck, after days of rain. New Englanders are tough, man. As I passed other Green Uppers later in my car, I gave them the same double-honk and thumbs-up out the window we’d gotten earlier. Good work, keepers of the Land! See the refuse of Green Up Days 2013 and 2012.